I was given the task of finding a good cafe for a client lunch in North Sydney recently. I was looking for a nice cafe, nothing too flash but something a bit nicer than a pub lunch and also somewhere that I would be able to eat something! 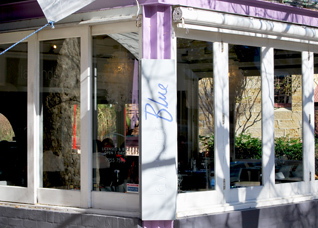 Having lived in North Sydney for six months I often walked passed Lavender Blue but never actually ate there. It looks nice and inviting from the outside and the food menu also looked good. Even better when I gave them a call they said that a number of their lunch options were gluten free and they even had gluten free bread. Now I know to some, getting excited about a sandwich may seem strange, however not many cafe’s have gluten free bread and I therefore find myself eating a lot of salads when I go out these days. I therefore decided to order the CLATT (chicken, lettuce, avocado, tomato and mayo) on gluten free bread at Lavender Blue. The sandwich was very tasty and was polished off very nicely with a glass of rosé. Everyone else at the lunch enjoyed their dishes ordering the fresh egg linguini with crab meat, gremolata, garlic and a touch of fresh chilli and the glutenous version of the CLATT. It was a great cafe for a client lunch, not too noisy and reasonable prices. Have you ever been to Lavender Blue? What did you eat there?